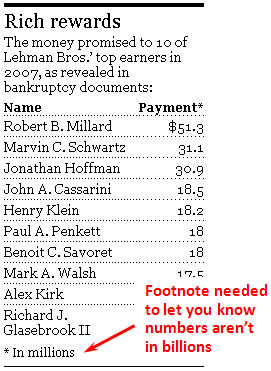 Less than a year before the 2008 collapse of Lehman Bros. plunged the global economy into a terrifying free fall, the Wall Street firm awarded nearly $700 million to 50 of its highest-paid employees, according to internal documents reviewed by The Times. ….The records illustrate that enormous pay wasn’t limited to top executives but was dished out to a wide range of traders and others who sometimes took home even bigger paychecks than the CEOs who ran their companies. It’s nothing to get upset about, though. Just a few bad apples. The exception that proves the rule. The black sheep of the family. Surely you don’t believe that all of Wall Street was doing this, do you?